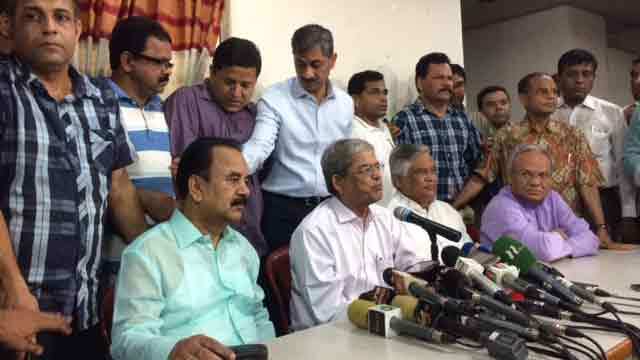 Dhaka, Aug 2 (Just News): BNP Secretary General Mirza Fakhrul Islam today extended his party’s all out support to the ongoing student movement demanding safety on roads and justice for their two fellows who were killed in a road accident on Dhaka’s Airport Road on Sunday. “It is a logical movement. We are extending our all out support to the students' demand,” Fakhrul said while addressing a press conference at the party’s Nayapaltan central office in the capital this noon. He also demanded step down of the government for its complete failure in all fronts including restoration of discipline in the transport sector. “The government is responsible for mismanagement in all the sectors. We are demanding the government to immediately step down,” he said. The government has destroyed all the institutions and shattered people's all hopes and aspirations through its misrule and repression, the BNP leader said, calling upon people to build a strong resistance against it to ensure its downfall. Referring to Prime Minister Sheikh Hasina's recent comment that slain president Ziaur Rahman was involved in the August 15, 1975 assassination of Bangabandhu Sheikh Mujibur Rahman, he said the prime minister made the allegation against Ziaur Rahman to shift people’s attention. “We condemn the prime minister for her allegation against Ziaur Rahman,” Fakhrul said. Ziaur Rahman was not involved in any assassination, he added. “Zia’s fate was inevitable (for the murder). I regret that I couldn't bring him to trial for the (August 15) assassination” as he himself was killed in a 1981 military coup, Hasina told a discussion yesterday to mark the beginning of the month of mourning. “No one has any complain against Ziaur Rahman and no witness blamed him. Despite this, the prime minister has blamed him for the August 15, 1975 killings,” Fakhrul said. The government is trying to shift peoples’ attention from the ongoing student movement and thus the prime minister has now cooked up the story afresh, he alleged. BNP standing committee members Mirza Abbas, Nazrul Islam Khan, Goyeshwar Chandra Roy were also present at the press conference among others.